Are you just getting interested in online poker, and you want to learn the essential texas hold’em rules? Then you have just found the perfect article. We’ve prepared this easy guide as a quick reference for new players who are just getting started with texas hold’em poker and need the basics laid out in a clear and simple to read explanation. Playing texas hold’em poker is extremely simple to learn, especially if you obey the number one rule for the player who aspired to develop some skill in the game. Asides from that and a few other key texas hold’em tips that you’ll read about in the section below, you just have to learn to be patient. That’s the single most important base skill that you have to start working on if you want to excel at online poker. Possibly the most popular online poker game out there, Texas hold’em poker can be played by anywhere from two up to twelve people using a standard 52-card deck. The goal of the game is putting together the best ranked 5-card sequence, which is known as “poker hand” (you can read about poker hand ranks in the detail here). Each player tries to find the best sequence by combining their two “pocket cards” aka “hole cards” dealt at the start of the round with the five “community cards” spread out on the table. The 5 “community cards” are revealed in three steps or “streets”, which are known by the name “flop” (the first three cards), “turn” (the fourth card) and “river” (the fifth card). Rounds of betting take place immediately before each one of these steps, during which each player can “call” the bet, “raise” the bet” or “fold” the bet. All the betting money goes into the “pot” which in the end of the round is awarded to the player holding the best poker hand (or split between players in case there’s a tie). There are in all rounds two mandatory bets aimed at keeping the game moving, which are called the “big blind” and the “small blind”. These are paid respectively by the two players sitting to the left of the card “dealer”, a rotating role in friendly games whose current position is established by placing the “dealer button” in front of the player who has this role for the present round. When you’re playing online poker things are a little easier for you as a novice player, since the game software will prompt you for specific actions at the appropriate times. 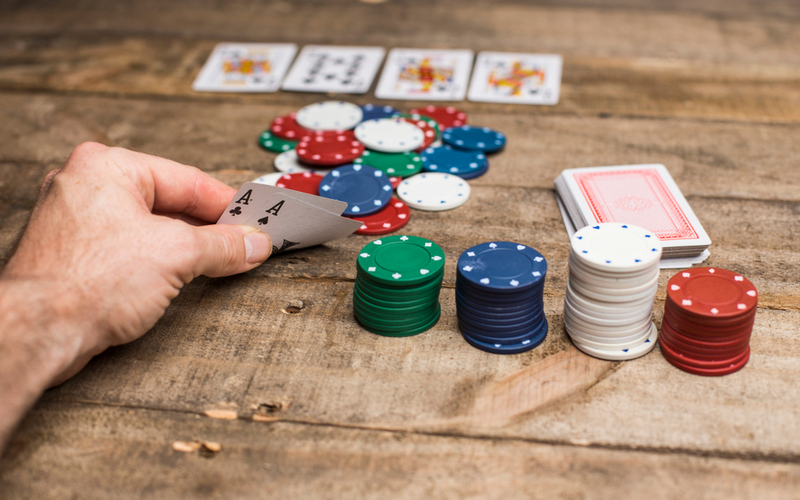 So if the texas hold’em rules summarized here still sound a bit confusing to you, no worries – a general idea will be all you need to start enjoying online poker. You will easily pick things ups as you play – especially since we want you to get in the habit of folding 9 out of 10 hands and only playing that 10th special round where you’re dealt really promising pocket cards. If you hope to become really good at texas hold’em poker someday, the single most important quality you have to start working on right now is patience. You have to become really good at watching and patiently waiting for the best time to make a move. And we’re not using the term “patience” light-heartedly, here! Think of it this way: the first 10,000 poker hands you play will be your initial learning curve from amateur to pro. You can go through this curve as fast as you like or take as many years as needed – but only once you play that many hands will you have the kind of skill that sets apart professional online poker players from the rest. Now you may be thinking, “but playing that many hands would cost a fortune!” but if so you’re missing the point. You see, playing 10,000 online poker hands doesn’t mean placing bets in every single one of those hands! If you’re looking to walk the golden road to being a poker master, you should get in the habit of folding at least 9 out of 10 hands you play – to begin with! So in the first 10,000 hands you watch, you should aim to only call the first bet in 1,000 hands – that’s 10% ! And in those 10% of hands that you call, make sure to only pay to see the river in the really promising 1%! That’s the kind of patience you need to become a true master of texas hold’em poker. Do you have what it takes? Previous Previous post: Earn Extra Revenue from Gambling by Becoming a Casino Affiliate!